It will not take much effort to realize that the stagnating diamond industry needs change, this has been true for decades. While change is never going to be easy, there can be no progress without ushering in change. A good starting point for improving the diamond industry would be to increase market reach, but before that happens it is important to understand the present situation. 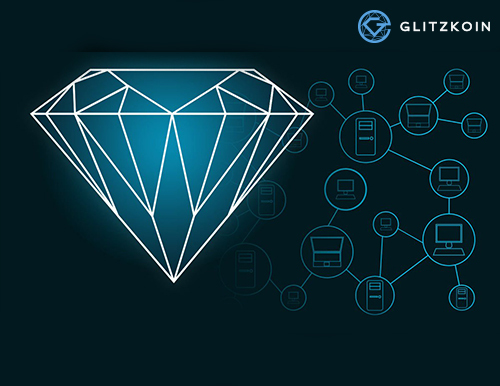 GLITZKOIN began work on this project by, pulling aboard diamond veterans with decades of industry experience. The weaknesses in the existing industry procedures and conventions, are experienced by buyers. You might have heard that diamonds are expensive, most rare things are not cheap. It is surprising that a diamond owner wishing to sell his precious stone, relies on the services of a chain of brokers. The stone moves through multiple hands, each hand heaps a profit margin on the price tag. The price charged for the diamond at the end of this lengthy supply chain, could be anywhere from 20% to 40% higher than, what the original diamond owner was willing to accept. This inflated price can put off many buyers, this is undoubtedly one reason why jewelry lovers are showing an increasing interest in colored gemstones. A change in the supply chain that, eliminates the need for middlemen would ensure a fairer price to the buyer. Talking about inefficiencies in the existing processes, there is much more than just multiple layers of broker fees and commissions. As the diamond moves from hand to hand, each point maintains manual records, very often incurs shipping and insurance charges and this adds up to business overheads. The interesting fact is that, any attempt to improve the industry without heavy reliance on technology, would only worsen things. After a thorough study of the present situation and charting out a strategy for the future, GLITZKOIN zeroed in on blockchain technology. We have scouted for the top talent in this technological arena, the end result is a dream team made up of diamond experts and technical gurus. The task on hand is well defined, the ICO (Initial Currency Offering) is set to include a crypto currency to handle payments related to trading on the diamond blockchain platform. Here is a quick tour of what the final project would accomplish. The blockchain would allow diamond sellers from across the globe to list their diamonds. The system will make it mandatory for every diamond listed to be certified by a reputed diamond testing laboratory. This will eliminate the worry related to fake diamonds and diamonds that are treated by using controversial processes. The grading and classification of diamonds has been established for a few decades, there is little room for confusion and guess work. A buyer can hook up on the same blockchain and review all the diamonds listed, prices quoted are by the actual seller – no middlemen and no added commissions and fees. While the good thing is that the buyer and seller can interact directly with each other, things get even better as the diamond certification brings trust and confidence to the transaction. The GLITZKOIN crypto currency, will enable payments for diamond purchases and other expenses like shipping and insurance, to be settled without spending on currency conversions and heavy bank fees. Most crypto currencies that are issued in isolation, the currency deployed on this blockchain will be active in the physical trading of diamonds. This important difference will also make it likely for other businesses to accept the GLITZKOIN crypto currency to pay for their products or services.